Bon was born on November 22, 1898 and died in Rome, Floyd County, GA on June 22, 1954. He married HETTIE LEDFORD daugther of Henry Ledford and Mary Ann Martin Ledford. Hettie was born on February 24, 1904 and died on October 11, 1920. NEVERT MAY BERRONG. (Born 10-09-1920 in Towns County, GA Died 4-11-1995 in Union County, GA) He married Robbie L. Parton in 1945. 1) Hettie Ledford & Bon Berrong had one child a son, Nevert May Berrong. Nevert was delivered at home by cesarean section. Hettie Ledford Berrong died two days later. Fortunately, Bon's sister (Neta Berrong Owenby) had a baby at the time Nevert was born. 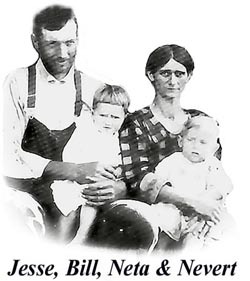 Since baby formula was not available, Neta took Nevert home with her and nursed him along with her own son; Bill Owenby. Nevert lived with his Aunt Neta and Uncle Jesse until he was old enough to eat solid foods and his father was able to take him home. Bon never remarried, Nevert had no siblings. 2) Bon shot and killed his father William M. Berrong, while intoxicated. Bon was convicted and sentenced to death in the electric chair. Two prominent citizens of Towns county, one being Dr. Rice, appealed to the Judge for clemency. His son Nevert, also had a petition signed by people of the town requesting that Bon not be sentenced to death. Bon was given life in prison. He contracted tuberculosis while in prison and died years later. He and Hettie are both buried in Bethaberi Cemetery in Shooting Creek, NC.